Telescopic PVC Belt Conveyors make short work of unloading loose-loaded cargo. Whatever your goods are moved in - vans, 40 ft containers or anything in between - you can find an SVE Telescopic Belt Conveyor that matches your needs. Installed close to the dock door, a number of steel sections are built one inside the other and stored in a base section. 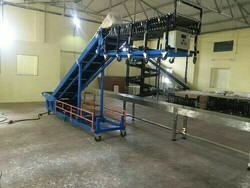 This means that the conveyor doesn't occupy a great deal of space, when not in use. When the vehicle to be unloaded (van, truck, trailer, container etc) pulls up to the door, the operator extends the telescopic belt conveyor to the required length, extending a little more as the vehicle empties out, so that the cargo (sacks, boxes, tires etc.) can be placed on the conveyor belt by the operator using very little effort. All items are transported by the belt along the telescopic conveyor to another conveyor in a system, or the items are off-loaded to a pallet. When loading the process is reversed; unit items travel along the belt to the operator, who stacks them inside the vehicle. As the vehicle fills up, the operator retracts the conveyor by pressing the joystick or smart pad. Easy to use, SVE telescopic belt conveyors are specifically designed for loading and unloading loose-loaded items quickly, safely and with a minimum of effort. 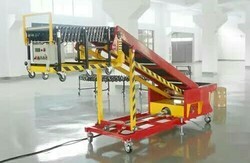 Telescopic Roller Conveyor offered find application in bridging variable distances from unloading or loading point. 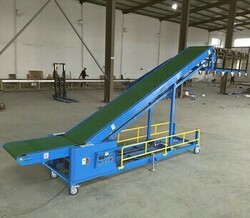 The conveyors come with quality lifting support and allow transportation of goods over long distances. Allowing extension like a telescope, these can be easily retracted as well as moved aside and are made available in different dimensions for light goods or with belt widths that can also be extended as demanded by customers. 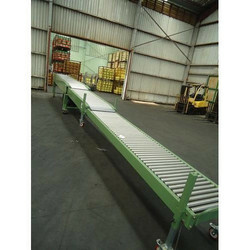 Looking for Telescopic Belt Conveyor ?